It is reported that in the era of modern warfare, nine out of ten casualties are civilians. In 1999 a group of individuals sought to establish a memorial to these losses. Stonewalk, the documentary, is the record of this effort. 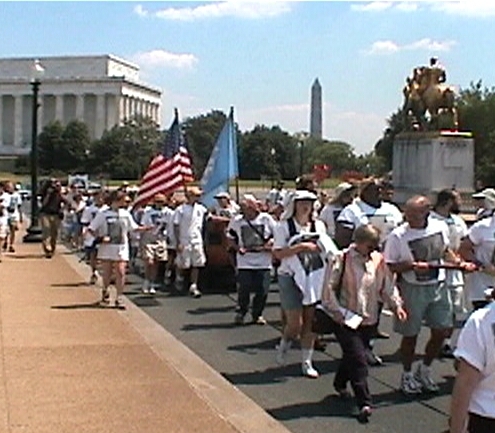 Stonewalk is the project of peace activist Lewis Randa who took up a 33-day, 500-mile journey, pulling a two-thousand-pound granite memorial to Washington, DC in hopes of seeing it placed permanently in Arlington National Cemetery. Overwhelmed by worldwide images of civilian massacre, Lewis commissioned a one-ton stone inscribed with the words "Unknown Civilians Killed in War." He traveled the eastern seaboard "waging peace" while enlisting community members to join his efforts. Stonewalk, the documentary, illustrates the power of the individual to act to change social values. It is more about the process of change and how individuals can contribute to it, then the end result of change. Lewis Randa, founder of the Peace Abbey in Sherborn, MA, conceived of honoring civilian casualties in the hope that, with more knowledge, individuals might greater realize the true costs of war and reevaluate its legitimacy as conflict resolution. Lewis describes his perspective on activism, "Grassroots politics is an extraordinary thing because it's a daily activity. Its not something you do, it becomes who you are." His wife, Meg, is initially less enthusiastic about Stonewalk and shares that, "Lewis always comes home with ideas, and they're always "unusual" ideas, and Lewis always thinks that all of his ideas are good ones!" The first members to sign on to Stonewalk as a concept were the students at the Life Experience School. These special needs students follow a curriculum promoting peacemaking in the community. They developed the concept of making the stone a replica of the grave markers found in Arlington National Cemetery and decided upon the words to be inscribed. Mohammed Ali, recognized for his courage as a war objector, accepted the honor of unveiling the stone at an April 1998 ceremony. Lewis engaged the support of Hugh Thompson and Larry Colburne of Veterans for Peace. The two Vietnam veterans agreed to be Co-chairmen of Stonewalk. Hugh and Larry illustrate why they feel strongly about raising awareness of civilian deaths in war by recounting their experience halting the My Lai Massacre of 1968. Hugh: "We saw some others (women and children), and it appeared that they had been marched down into this ditch, and American soldiers standing on either side opened up with automatic weapons." Larry: "We knew we had to take action, not talk, but do something." Stonewalk left Sherborn, MA on July 10, 1999 with five core participants who walked the entire 500 miles and over 100 volunteer "Stonewalkers" who walked it through the first town. Core member Simon Augustine, an intern from Harvard Divinity School jokes, "We're gonna get to know each other more than we ever wanted to." The audience meets the main characters, spending time with each person and learning about their motivations as the walk progresses. Karl Schlotterbeck, recently promoted from direct care in human services to administration, decided to forego paper pushing and begin walking. Earl Standberry, former Marine and Gulf War Veteran, describes his transformation from a crack addict to a disciple of the Peace Pilgrim, "walking for peace" wherever he is needed. Lewis describes his reasons for performing the walk, "What's powerful about the movement of this stone is that it moves people to take a stand. And so often in life we sit by and we read the paper and we criticize communities and our government leaders, but rarely do we have an opportunity to step forward and say, I'm gonna put my body where my mouth is and that is to live what I'm saying, and not simply to talk about it but to get physically, emotionally, spiritually, and morally involved." Though a record of an uncommon event, the film is designed never to lose sight of the original inspiration behind the action. That is, civilian casualties of war can outnumber military casualties at an alarming rate of nine to one. Throughout the film, graphic transitions highlight many historical statistics, reminding the viewer of the "back story" behind the cause. Maps and mileage graphics also convey the incredible physical challenge and accomplishment of the walk itself. In light of recent events, the relevance of the peace movement has been brought into question. Some feel it died years ago, some feel it has no place today, and many don't understand what is really at its core. Stonewalk, on its greatest level, seeks to answer these questions. The movement is not about protest; it is about action. It is about the value of the individual in working for change. The documentary depicts an event whose idealistic goal was to create tangible reform on a large scale yet in the end, found success on a different level. Lewis explains, "We've been asked thus far if this has been successful. I think anytime someone follows their conscience, and is willing to move forward with vision and idealism to see something through - that's always successful. That's the mark of a successful life."